Once again Movie Night rolled around and once again I had fun even if no one else seemed to. Well you canâ€™t please everyone so you got to please your self. Truth be told Movie Night is hard to pull off every time because there are so many different groups that every once in a while some people come and they just donâ€™t mesh too well. Thatâ€™s what happened this time but after the ice broke and one of the groups went home things picked up quite nicely. The chicken parmesan recipe that Fatty gave us was awesome! We ran out of the correct spices so it was missing the perfect zing but thatâ€™s ok, practice makes perfect. I thought we made way too much but once again to my surprise, no left over food. When Larry Daley, a divorced father who can’t seem to keep a job for more than a week, applies for a job at the Museum of Natural History, he is assigned as a night guard. However, a seemingly easy job turns out to be a wild ride when he finds that an ancient curse has caused the “inhabitants” of the museum to come to life. This was my second time seeing this movie and I liked it a lot more this time around. Its not your typical Ben Stiller movie, but this time knowing that it was a kids movie allowed me to accept and enjoy the humor better. It is really amazing how your perceptions and pre-conceived notions about a movie can drastically change your attitude about it. All in all it was a good Move Night, I liked the food and the movie was great. Last night movie night carried a special theme with it. In our planning I didn’t think we’d even have any Jews there. 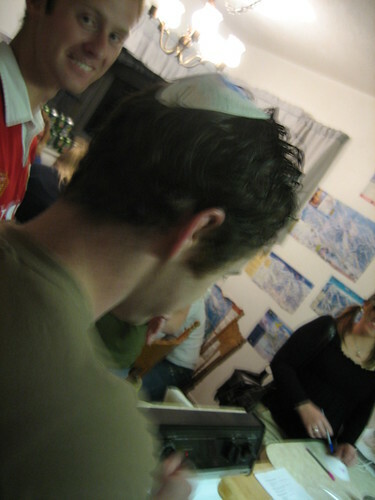 As the night got under way we got into a discussion about the spelling of Kippah (pronounced Yamacka) and to my surprise Mitchell revealed himself to be our local Jewish expert. He grew up Jewish and celebrated passover with his family. Feeling legitimized by our new found jewishness we moved forward with vigor. We made kippahs with pride. 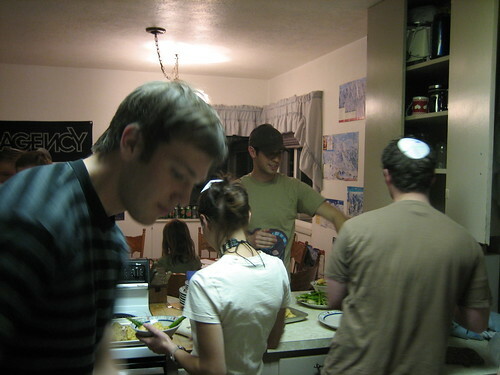 Everybody designed their own and we clipped the makeshift kippahs to our heads. Rad? Sweet? What’s the word I’m looking for? Ah, yes, awesome… dot com. Enjoy the pictures. 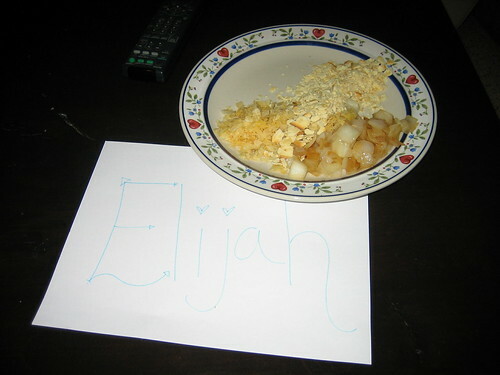 We even put a plate out for Elijah but he never showed. I don’t blame him, all he got were chips, onions and wannabe Matzoh. For anyone curious, we made Passover Chicken and Chips, Mini Potato Knishes, Asparagus and Jolly Rancher kool-aid. 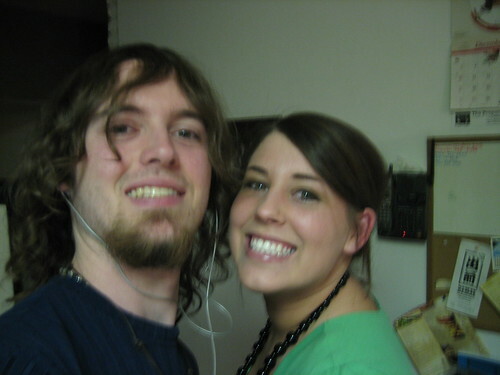 Everything was kosher…at least I assume the kool-aid was. Movie night was another success despite the cosmic disruption that we call Valentines Day. Today being in my opinion the worst day of the year, I had a surprisingly good time. 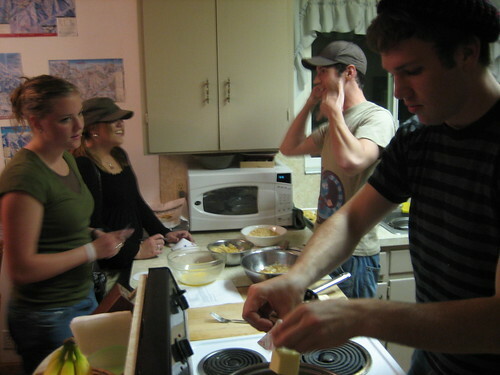 We started with a great Baked Pasta Shells recipe that Dan and I sort of just made up. Then after dinner everyone chatted and we even got a rendition of Tree Boy going on, I have to say that while it is fun, it is not quite as exciting if everyone isnâ€™t willing to sing. Finally we left for the theater, on time for once I might add and everyone got tickets for the show, well almost everyone, I have been noticing a high attrition rate between the white house and Movies 8. In South Boston, the state police force is waging war on Irish-American organized crime. Young undercover cop Billy Costigan is assigned to infiltrate the mob syndicate. Colin Sullivan, who has infiltrated the police department as an informer for the syndicate, is rising to a position of power in the Special Investigation Unit. When it becomes clear to both the mob and the police that there’s a mole in their midst, Billy and Colin are suddenly in danger of being caught. This film is good but not great. The story line had major potential but instead of spending money on developing it they through it all into big name actors and flashy effects. Honestly the dialog was un thought provoking with the F-bomb alone being dropped 237 times. Then the story ends in the worst way possible. Trying for a â€œshockingâ€ or â€œmind-blowingâ€ ending they added another mole to the mix and in less then a min everyone dies. Now if that was how it ended I think the movie would have been much better but then they continue to drag it out and try and give you another â€œtwistâ€ by killing off the main character in a random act of premeditated violence. But after the shocking second mole this little twist left you wishing the movie had ended five min ago. This weekâ€™s movie night was a success. As usual the night began with Dan and I, running around frantically getting together all the ingredients for this weekâ€™s meal that we were preparing for what we thought would be close to twenty people. 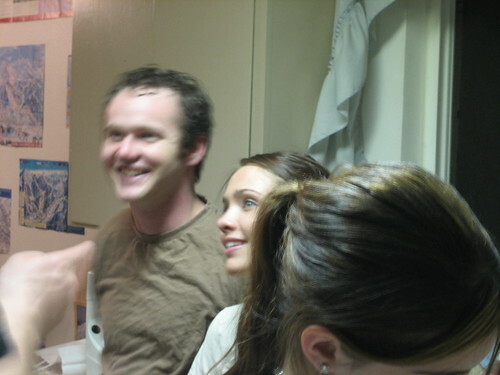 Then as usual the calls began to come inâ€¦ everyone canceling for one reason or another. Well with a few well placed phone calls and one risquÃ© house call, we where able to pull together a decent group. Seventeen by my count, lets try and get a few more next week eh? The shepherdsâ€™ pie was really good and we made plenty for everyone along with roles and juice drinks, we had cookies at the beginning but Ian seemed to have eaten them before anyone else made it. It was an easy recipe and cook time was under an hour and a half and we got everything for $22.59. The Prestige is a movie that seems to befuddle everyone for the first time. I must say that the second time around was a very enjoyable experience. The beginning is riddled with clues to whatâ€™s going on and as Sara said â€œOnce you know the trick itâ€™s really quite simple.â€ The Prestige is the story of two magicians, whose intense rivalry pits them against each other on a life-long battle for supremacy, leading instead to a life full of obsession, deceit and jealousy, jeopardizing the lives of everyone around them. This story is well told and presented beautifully making for an enjoyable if a bit drawn out night at the movies. Costs for our admissions were a dollar a piece. This weekâ€™s Movie Night with shepherdsâ€™ pie: $24.59 Minus the $2 from Movie Night donationsâ€¦.$22.59.